One match played, one defeat; in the opening round of the Men’s Singles qualification tournament that precedes the Seamaster 2018 ITTF World Tour Lion Japan Open in Kitakyushu, such was the lot of the host nation’s Sora Matsushima on Tuesday 5th June. He was beaten by Hong Kong’s Ho Kwan Kit (11-6, 11-9, 11-7, 15-13); yet the young man from Kyoto, situated in the central part of the island of Honshu and once the country’s capital city, was the centre of attention. The reason is that, born on Sunday 29th April 2007, he is only 11 years old; he is young enough to be competing in Hopes events, let alone a Men’s Singles competition at a prestigious ITTF World Tour tournament. Nothing to lose, the exuberance of youth, seeking every opportunity to make the first move, the all action left hander gave Ho Kwan Kit more than food for thought; from both backhand and forehand he attacked without a care in the world. Simply table tennis is in the blood; parents Takashi and Yumiko were Mixed Doubles semi-finalists at the All Japan National Championships in 2001; at the time they were university students. However, more pertinently, he is the grand-nephew of Tokio Tasaka, the owner of no less than six World Championships medals. In Munich in 1969 he was the Men’s Doubles runner up in partnership with the late Nobuhiko Hazegawa and Men’s Singles semi-finalist. Later in 1971 in Nagoya he was member of the silver medal winning team as well as Men’s Doubles bronze medallist again with Nobuhiko Hazegawa. Later in Sarajevo in 1973, he was once more a member of the Men’s Team that secured bronze, whilst in 1977 in Birmingham, he was the Mixed Doubles runner up; his partner in the English city was Sachiko Yokota. She is the Tournament Director at the current Seamaster 2018 ITTF World Tour Lion Japan Open. 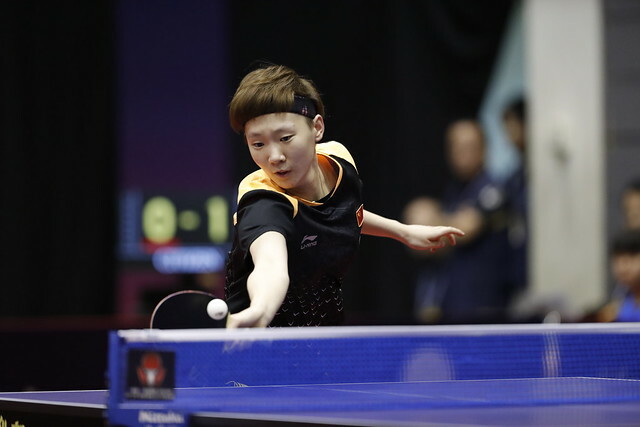 Undoubtedly Sora Matsushima oozes talent, there is a view that at the same age he is ahead of Tomokazu Harimoto, a player who has left crowds open mouthed with wins against celebrated names. Certainly he would appear to be matching Tomokazu Harimoto. In 2010 and 2011, Tomokazu Harimoto won the Under 8 Boys’ Singles title at the Under 12 Japanese National Championships. Later in 2012 and 2013 he secured the Under 10 Boys’ Singles title, before in 2014 and 2015 being crowned the Under 12 champion. Sora Matsushima is on the same path. In 2014 and 2015 he won the Under 8 Boys’ Singles event and then in the Under 10 age group repeated the performance in both 2016 and 2017. Now can he win the Under 12 titles in 2018 and 2019? Talented young men and one talent that Sora Matsushima possesses, according to Kunuhito Tasei, the National Team coach, is that he is mentally strong and has a voracious appetite for the sport; you can correct technique in a player at a young age but implanting a strong mind is not that straightforward. Understandably Sora Matsushima is ambitious, he dreams of greater glories but a great deal of water has still to flow under the bridge. Just for the moment, let us forget what the future may hold; let us not place unfair expectations on one who has yet to reach his teenage years. Let us enjoy watching Sora Matsushima play table tennis and let Sora Matsushima enjoy playing table tennis.